If you are staying in Cappadocia and looking for an affordable local guided tour in Cappadocia this tour is for you to explore Cappadocia in cheapest and most comfortable way. Our Cappadocia Tour starts with a pick up service from your hotel. DEVRENT VALLEY: Devrent is situated on the northern slopes of Aktepe, 1 km from Pasabaglar (Monks Valley) and 5 km from Avanos. The ruins at Devrent are spread over three valleys, which also house several pointed fairy chimneys with large stems. GOREME MUSEUM: Goreme an important Christian centre in the early years of the middle Ages, was a bishopric administered by Mokissos near Aksaray in the 11th and 13th centuries. Despite the vast numer of monasteries, churches and chapels in the vicinity of Goreme, there are not many inscriptions bearing dates. For this reason, these religious buildings are mainly dated according to the iconography or architectural features. After the guided Cappadocia Tour we will drop you back to your hotel in Cappadocia. 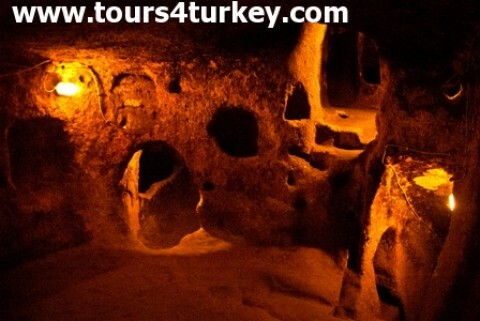 The North Cappadocia Tour price is 40 Euro. 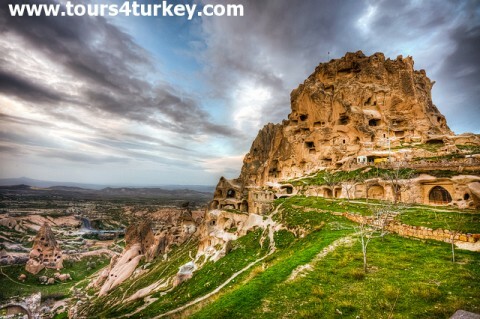 Second Day Tour of Cappadocia takes you to the sights in South. CAVUSIN: One of the oldest settlements in the area, Cavusin is sutiated 2km from Goreme, on the Goreme-Avanos road. The Church of St.John the Baptist offers a panoramic view of the village. This church and its paintigs date back to the 5th century, making the oldest church in the region. It had a large courtyard which is unusual for Cappadocia, this has been eroded away however. HOSPITAL MONASTERY: One of the oldest monastery in Cappadocia. After the tour we will drive you back to your hotel. Transfers from/to your cave accommodation.